In PROUT there is no freedom to become as wealthy as some may like to be. Isn’t this a curtailment of basic human rights? PROUT sees the idea of wanting to become infinitely rich as an expression of insanity and opposed to human rights. PROUT’s view on the natural limitations of wealth considers two aspects of it in particular. Firstly, mundane wealth is in limited supply. When a few economically-adept people acquire lots of material wealth and go on manipulating its value without the slightest concern for the basic needs of large masses of people, such misuse and abuse is sure to have an adverse impact on the lives of very many. Basic human rights violations resulting directly and indirectly from inordinate capitalist accumulation include: Large income and wealth gaps, pervasive lack of proper education, hunger, and numerous other forms of physical, social, intellectual, cultural, etc. poverty. The inability among the affluent to empathise with and act firmly on such disproportional disparities is certainly an indication of mental illness and is not their human right. Secondly, physical wealth, being limited, cannot satisfy the human thirst for limitlessness. PROUT’s concept of progress suggests that the path to human happiness and existential fulfilment leads via higher pursuits. As long as capitalists accumulate physical wealth beyond reason, they only make life more and more miserable both for the deprived and destitute masses and personally for themselves. Capitalists will not become happy in this way but only increasingly frustrated, disturbed, deranged and in the end dangerously mad. 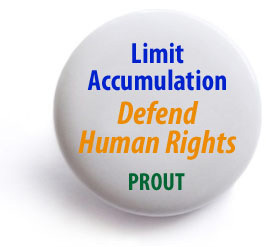 For these two reasons first and foremost PROUT limits the accumulation of individual wealth as a primary step towards rational distribution and human rights for all. Previous PostHow to Unite Human SocietyNext PostHow Can “Local People” Manage the Economy? This inordinate pursuit of wealth in the United States is exactly what is undermining the implementation of the American Dream for all. Yet, becauses most people have to work to survive,there is not the energy left over to formulate ways and means to defeat this type of accumulation systemically, by changing or evolving our laws. What possibly could help in a small way would be to change the role of “elders” in our society. They have the time, the wisdom(for the most part) and compassion to engage this conversation in all cities and towns across this nation. To me, being an elder, we have so much more to offer our society than a list of our illnesses and limitations. The first thing, however, I would change the word senior a word that commands more respect . Maybe someone can come up with this name? Anyway, as most of us have to work part-time just to stay out of poverty, I see this activity as possibly starting a new way of thinking in our country about consumerism. Can Atom Bombs Destroy Human Civilization?